Business Succession Planning Thoughts | The Levin Law Firm - Philip Levin, Esq. 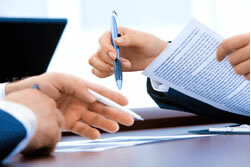 The Levin Law Firm provides a variety of legal and consulting services to businesses and their owners. One of our most sought after services is the guidance we provide to clients in their Business Succession Planning. We help our clients to identify and articulate clear long-term goals for the disposition of their businesses. Thereafter, we develop and implement a comprehensive Business Succession Plan designed to help our clients execute the strategies for achieving their goals. Without a properly designed and funded Business Succession Plan, many business owners, and surviving family members, end up with far less value upon the disposition of their businesses than they might otherwise have realized. In the worst case scenario, a business simply shuts down after the illness, incapacity or death of its owner. The result can be devastating financial losses for the owner’s family, along with serious damage to the careers and morale of surviving owners and employees, as customers who relied on the business have serious doubts about the continued financial vitality of the business. In short, without an up-to-date, properly drafted and funded Business Succession Plan, everyone stands to lose. The first step in developing an appropriate Business Succession Plan is to focus on the end result for all interested parties. There are many types of Business Succession Plans, and the proper plan is based upon multiple financial and tax related factors, coupled with the goals of our clients. 1. The business owner wants to create a lasting legacy that continues after he or she is no longer involved with the business. 2. The owner wants to maximize the value of the business for sale, either to insiders or to outsiders. 3. The business owner wishes to create an ownership and/or employment opportunity for children or grandchildren. 4. The owner wishes to provide ongoing employment opportunities for hard working key employees of the business, now as well as after the owner is no longer involved. 5. The business owner wishes to “make a difference” in his or her community (in whatever way the owner defines “community” and “difference”). Business Succession Planning is critical to all of the “stakeholders” in a business – that is, its owners, employees, vendors, customers and the communities in which the business operates. Proper deliberation and thoughtful implementation of such a plan allows everyone to benefit. The topic of Business Succession Planning is a complex one, and this edition of Estate Planning Matters just scratches its broad surface. Planning considerations vary substantially and are based upon whether or not the exit goal is a sale to an outside third party, or a sale to “insiders” (key employees), or a gifting program to family members. Each of these avenues have different financial, tax, and estate planning consequences to the business owners, their families and their employees. It has been said that, “Twenty minutes before the prom is no time to start taking dancing lessons.” This is especially true in the context of Business Succession Planning. A properly drafted exit plan should be designed, funded, and established while all business owners are alive, well, and have relatively equal negotiating abilities. There are many choices and implications that should be considered carefully – and sooner is better than later. At The Levin Law Firm, we listen to the goals of our clients, then establish and implement effective Business Succession Plans. In order to add value to your relationships with clients and help them to achieve their estate planning and business disposition goals, please call The Levin Law Firm to arrange a Complimentary Consultation at (610) 977-2443.